I recently saw a flock of robins in my back dooryard. To see so many, it must be a harbinger of spring! We have been fooled before; I will think spring when I see green grass in the dooryard. Our volunteers have been busy with various projects. We have several collections of antique and vintage clothing. Although this clothing has been housed in archival boxes, it really needed to be sorted and cataloged. We purchased several more archival boxes, of various sizes, and the volunteers got to work! Our collection has been examined, wrapped in archival tissue (at the cost of $1.00 a sheet!) and a complete listing was included in every box. We now have eleven boxes of clothing. What a treasure! Included are the World War II Navy uniforms worn by Lionel Fecteau: work and dress uniforms, with the “13 button” front on the trousers, and his Navy cap. We also have a lady’s black dress of very fragile silk, handmade, with this written inside: “This dress was 100 years old in 1879.” This dress came from the Gordon/Scammon collection. Come by and take a peek at our collection; we love to share with anyone who is interested. We have two dress forms that have been dressed with beautiful cotton garments that we have on display. We are very busy archiving old documents. We found a box with Epping voter checklists inside. These checklists were folded, placed into envelopes and stuffed in a box. They are now unfolded and are separated and placed in a large archival box. It is not a complete list, but the years start with 1815 and end in 1847. Several of the checklists indicate it was a Presidential election. Fascinating! They are all handwritten, with the date and party, including the Whig and Federalist parties. Come spring, we hope to add several memorial bricks to our walkway. What a great way to pay tribute to our loved ones. One graduating class of Watson Academy has provided memorial bricks for their classmates who are no longer here. The cost is $50.00 per brick. You can have three lines, with fourteen letters, including spaces, on each line. This lasting memorial is a wonderful way to keep memories alive. This is an ongoing project that you can take advantage of anytime. The Epping Historical Society is always looking for old pictures, letters and documents to add to our history. We can make copies of these if you wish to keep the originals. Sadly, many in the younger generation are not interested in keeping their family history and may just toss it. Fortunately we can save and preserve a lot of family history. Give us a call if you have history you are willing to share; we are always looking for information involving Epping families and places. The most exciting news! We are in the process of creating a new web site. It is time we made ourselves more visible to our town. We are working on several ideas for the content. It will be up and running in the spring. One of the most outstanding events ever given in Epping was given in 1931. The pageant, “The History of Epping,” was presented under the auspices of Sally Plumer Chapter D.A.R., in cooperation with the public schools. It was the first time in the State of New Hampshire that this was attempted, as the players were from the public schools. Over one hundred and fifty took part. The children who participated included first graders through seniors in high school. A few adults were also involved. This was quite an undertaking, and never would have happened without the Superintendent of Schools, and all the teachers encouraging their students to become involved. There were fourteen parts of the play covering all of our colorful history. The pageant was written by Mary Blair and Sylvia Sanborn, depicting the history of Epping from the purchase of land to World War I. The pageant was held at the Epping Town Hall, and the building was packed! The pageant not only gave the children a vivid picture of the history of their native town, but taught valuable lessons in patriotism and citizenship. The audience that was present taxed the capacity of the hall and included people attending from all of our surrounding towns. The year 1931 was unusual, but the D.A.R was trying to create an interest in history for the younger generation. This event occurred during the great depression, and in that time period, history was fading in the eyes of children. What better way to spark an interest than to create a play, involving them as the actors? That was a brilliant idea; perhaps something of that nature should be tried again in Epping. What do you think? Come visit us at the society. We are open Monday morning, 8:00 to 12:00, or when the flag is flying! If this is not convenient for you, please call me at 679-2944 for an appointment or you can email me at: joysgarden@hotmail.com. 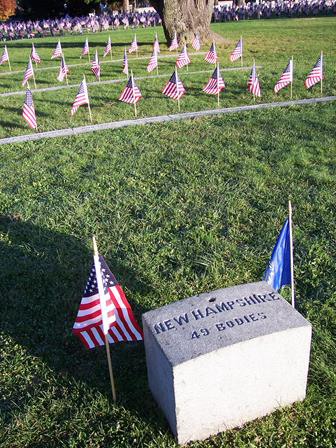 The Civil War Roundtable of New Hampshire welcomes anyone with an interest in the American Civil War who would like to be with others who share the same desire to learn more of this time in American history. We are an informal club with the only requirement being a Civil War enthusiast. If you or a friend has an interest in the American Civil War, we invite you to come check us out. For more information on the group and a complete schedule of meetings and news, please visit the web site: www.cwrt-nh.org or email cwrtnh@gmail.com. We are currently booking 2019 meetings. If you know someone, or would like to offer a talk to our group, please email: cwrtnh@gmail.com. Note: The schedule is subject to change without notice. You can access the CWRT-NH website for the current schedule. If a meeting is cancelled, a notice will be put on ETV. March 15, 2019 – Sarah Batterson (Professor - Granite State College) - "Women Soldiers of the American Civil War"
April 12, 2019 – (note: this is 2nd Friday to avoid meeting on Good Friday) – Michael Schroeder (CWRTNH President) -"Wild Rose and Crazy Bet: Female Spies in Blue and Gray"